Sure he still may be fired, and Athletic Director Dave Brandon may have told him it was coming, but as of last night Rodriguez was apparently still an employee of the University of Michigan. So while many Michigan media outlets (and some national ones) were backtracking, or running corrections and clarifications, we had reported nothing on the air except that a meeting between Brandon and Rodriguez was underway. Don’t think we weren’t trying to get more. When a Detroit TV station first reported unnamed sources told them Rodriguez had been fired, we went into high gear trying to confirm it. We sent reporter Steve Carmody to Schembechler Hall in case a press conference took place, we had our sports commentator John U. Bacon trying to confirm it, we monitored other media outlets, and we worked the phones. Soon other media outlets, including a major newspaper, were reporting what the TV station said. But we decided not to put a story on the air or web based on one anonymously sourced story we couldn’t confirm. Then another paper reported their unnamed sources said Rodriguez was fired. At that point it was beginning to look like we just had bad sources. We don’t cover a lot of sports, it could happen. I still wasn’t comfortable saying anything on the air, but we did post on our website that other media outlets were reporting and that we were working to confirm it. We updated the website story throughout the evening as more information became available. Around 5:30 – we thought we hit pay dirt. A well placed source in the university administration told a Michigan Radio employee it was true. We had it on our website and Facebook and Twitter pages for all of 60 seconds before the source said maybe they weren’t that sure. Then, around 6:00 pm….there was finally an official word from the university. Nobody had been fired. It didn’t mean someone wouldn’t be fired soon, but it hadn’t happened yet and fortunately, we hadn’t reported it on the air yet either. 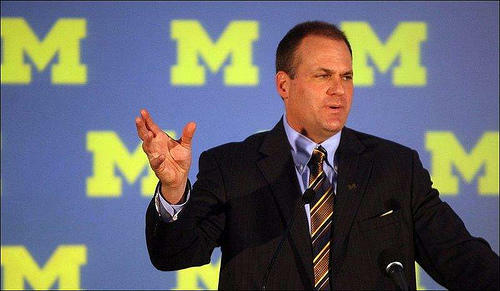 Rich Rodriguez might be fired Wednesday, he might be fired Thursday, but you can be certain that you won’t hear it on Michigan Radio until we know for sure.